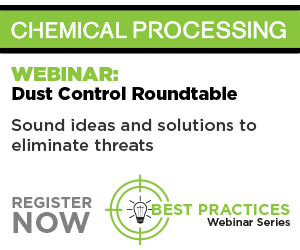 Last month we hosted our first online roundtable featuring industry leaders in hazard identification, evaluation and control of combustible dust hazards. Lead by Guy Colonna, division director of the National Fire Protection Association, our panelists answered some tough questions to increase awareness of the hazards and the available safeguards against fires and explosions when handling and processing combustible solids. Normally I’m the moderator for these events but this time I simply offered introductions and was able to sit back and listen as our experts put forth valuable information and addressed some tough questions. The panelists included Jason Krbec, sales engineering manager at Jupiter, Fla.-based CV Technology; Bruce McLelland, national account sales manager at Fike Corp., Blue Springs, Mo. ; and Gerd Mayer, president of Rembe, Inc., Charlotte, N.C. While these panelists were also sponsors of the event, they brought years of experience and knowledge to the discussion. You can watch the on-demand version now. Scroll to the bottom and click on any of the events that pique your interest. One quick registration grants you access to all of these events for free.